When I was in high school, I was befriended by this loud outspoken, tall, beautiful girl who happened to have a black belt in karate. She taught me karate, showed me what it means to be a good friend, and gave me the beautiful gift of friendship. Fast forward a few years, and Sam and I had stuck together for the most part. She had gorgeous twins girls at 19, which was a bit of a scandal at our church, but she took it all in stride. I found myself in a similar situation at 20. Pregnant, scared, hating myself. But did Sam judge me? No. Did she yell at me? Maybe a little. But mostly, she loved me. I don’t know what I would’ve done without my beautiful, fearless friend. She was the photographer at my wedding, my best supporter. When her girls were about 1, Sam started having awful back pain. She went to the ER a few times, but was just given pain pills and sent away. She had no health insurance. When her girls were a few years older, she met an amazing man and was married in January of 2006. Shortly after she married, she had a beautiful baby boy. 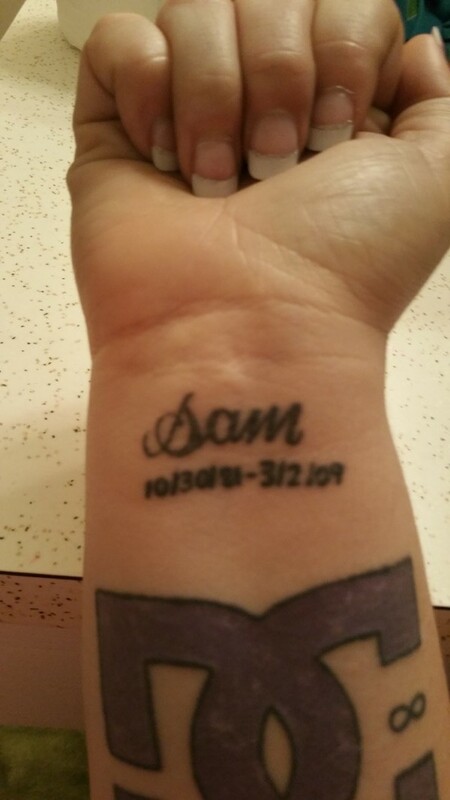 The entire time, from onset of pain to her son’s first birthday, Sam suffered. Her condition got so bad during pregnancy that doctors finally took notice. By now she had military coverage since her hubby was a naval submariner. He was gone six months of the year in three-month chunks. During one of those away times, Sam’s doctors decided it was finally time for some more conclusive testing. She had no help, so I packed myself and my 2-year-old and 6-month-old and went to help her for 10 days. During that time, I cared for my sick friend, laughed, cried, watched way too many episodes of Scrubs, and got the gift of being there for my friend. We had some amazing moments, some scary sad moments. But those will be there forever and for this, I guess I have to say thank you to cancer. That was the name of the culprit, the nasty awful thing that eventually stole my beautiful friend’s life. CANCER. Sarcoma, actually. A week after I went home, Sam called me. She was in tears. The results were in, and her doctor asked her where her husband was and said it was time to bring him home. She wanted to wait to tell Sam when Josh was there. But in true Sam fashion, she demanded answers. She wanted to know, so she could make a plan and be there for Josh when she had to break the news. Selfless, always thinking of others, that was Sam. CANCER. A mass the size of a peach on her spine… more tests. Josh was flown home immediately. A few days after that, the doctors scanned Sam’s body to figure out the size of the tumor. Well, what they thought was a mass on her lower spine turned out to be EVERYWHERE. In Sam’s words, “My entire pelvis and some of my lungs and other parts lit up like a frigging Christmas tree!” I sat down for that one. I asked her what the plan was. There was always a plan. This was Sam! Fearless and flawless and beautiful. Surely she would beat this! And she tried, oh how she tried. She fought with all her might. Her doctor said (after a couple rounds of chemo and radiation) to go home and get her affairs in order because there was nothing they could do for her, that she had maybe 6 months. She looked at them and said, “F&%$ you! I’ll go out on MY OWN terms!” She bought herself another year or so of good quality life with sheer will and a special diet she read about. In March of 2009, my sweet friend, my beautiful, amazing, warrior, passed away. We stayed in touch over all those months. I never got to see her again in person. She never met my youngest son, although she demanded I call her when he was born, even if it was 2 a.m. I’m thankful he was born at 11 a.m. instead. Sam and Josh bought a home, she painted it and remodeled it. She ripped bushes out at 7 a.m. and called to tell me about it. She lived her life fully and fearlessly until she just had no energy left. So I guess I wrote all this to say, cancer taught me a lot. It taught me to cherish moments, cherish life. Cancer taught me that even though it crushes someone’s body, it can’t crush their spirit, not truly. Because I know Sam and I believe that she’s in Heaven right now, singing and dancing like a loon and probably helping Jesus pick new paint for his walls. So thanks, cancer, for teaching me to slow down and also for letting me know you can’t ever truly win. Love conquers all. Sam lives forever in my heart and I’m the mother and friend I am today because of her example. So thank you to Cancer, and to Sam, I love you sweet one. See you when I get there. A longer version of this post originally appeared on Me, You, Wine, Cheesecake, and Autism.